Yeah I’m still fascinated with southern peaches over here. 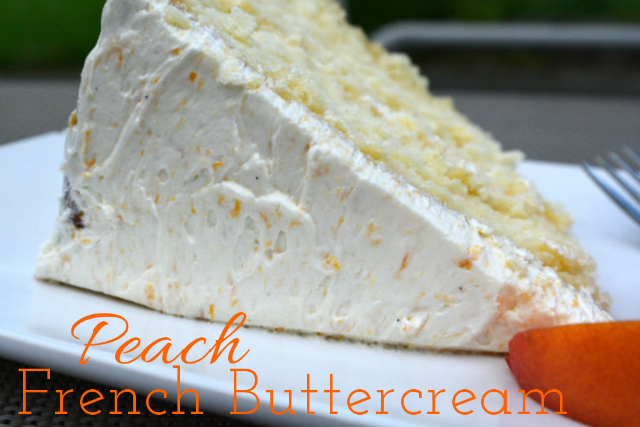 I’ve been eating a couple a day and thought wouldn’t fresh peach French buttercream frosting be amazing on a cake? Who am I kidding? I love cake just as much as frosting. You never have to twist my arm to have either. But there’s just something about ripe, juicy peaches that made me think wouldn’t frosting be amazing? 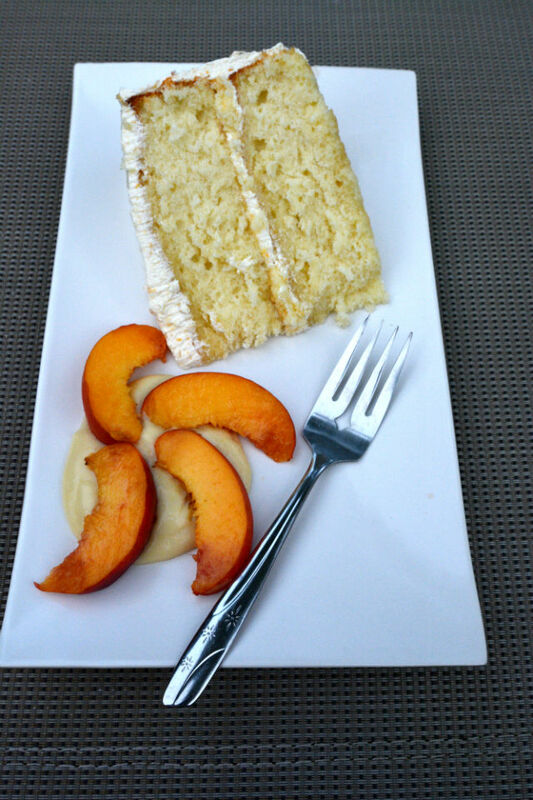 So I’ve taken the classic yellow butter cake and topped it with this light fluffy peach French buttercream frosting. Your first question is probably…what exactly is French buttercream? It’s not as sugar laden as the American buttercream. To make an American buttercream you basically whip a pound of powdered sugar together with some butter and flavoring to get frosting. It tastes pretty sickly sweet to me. Earlier last year I came across a recipe for a French buttercream and after making it once, I’ve been hooked. A French buttercream is basically a heated mixture of egg whites and sugar, which you then whip like you would a meringue and incorporate butter and sugar last. It’s shelf-stable, doesn’t weigh down your cake and it tastes even better the next day! Anything with butter tastes better the next day. No, it’s not as scary as it sounds. Sure you’re using more than just a hand mixer but when it comes to cake the frosting is key. Well, you know after you get the moisture content of your cake and then you need a fabulous frosting to match it. In the summer, we’re leaning towards lighter fare literally. We want that spongy or whipped feeling to lighten our mind so we think less of dousing ourselves in sweet carbs and more about gently topping off that grilled meal with a cloud of dessert. I predict more fruit based frostings forthcoming this summer. Any requests? Southern peaches are hard to share. Create the ultimate frosting for any cake this summer! Lets start with the peach puree. Peel, pit and slice 2 smallish peaches into a small saucepan. Cook peaches on medium heat for about 5 minutes until they start to soften and juices release. Allow to cool and then puree in a food processor or blender. Set aside. Set up your double boiler on the stove over medium heat, combine 3 large egg whites and sugar whisking together to form a thick slurry. It will actually look kind of like a thick gooey mess. Place the bowl over the simmering water and whisk occasionally for 6-8 minutes. Remove from heat and scrape into a medium sized mixing bowl and beat until mixture turns into a shiny white meringue and is cool to the touch, about 6-8 minutes. Reduce the speed to low and add butter in chunks, mixing well after each addition. Once all the butter has been added, beat another 3-4 minutes or until its thick and smooth. Add in vanilla and peach puree and mix well. At this point the frosting is ready to use either on a 2 layer cake or 24 cupcakes. @plblock557 I knew it was :) I'm glad you liked the cake. I'm itching to bake one tomorrow, but can't decide what flavor frosting to go with. The cake looks so moist and the frosting so creamy. Like the combination of flavors too. It turned out really great. Once making the French buttercream all other frosting have paled in comparison.